It’s continuously becoming popular for carriers to offer discounted prices on the latest Samsung Galaxy S8 and LG G6, but it’s the first time we are seeing a buy one get one free deal in the U.S. 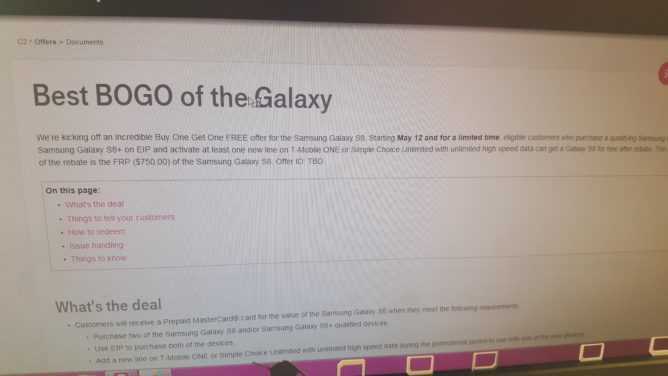 According to post on Reddit, T-Mobile has plans to offer its beloved customers a buy one get one free deal on both Samsung Galaxy S8 and S8+ starting today. However, as usual with an enticing deal, there are a few catches that are involved, but still, you’ll end up with a free phone. For starters, T-Mobile says that you must first buy two phones – be it two Galaxy S8 units or two Galaxy S8+ units – before you get the refund for the second phone you bought. In addition to this, both phones must be bought via the carrier’s installment plan and to make life even harder for you, one of these two new catches must also be on a new line with the T-Mobile One unlimited data plan. Just in case it happens that one of these two lines is an upgrade, the carrier insists that it must be on unlimited data. Also note that the Galaxy S8 or S8+ rebate will come in the form of a prepaid MasterCard with a maximum value of $750, but you’ll have to wait a few weeks before it finally comes about. As you can see, this deal only covers the full cost of the standard S8 and not the S8+, which costs $850. Of course, this doesn’t mean you won’t be able to get the S8+, it only means you’ll get cover worth the price of the standard S8. If the new Samsung Galaxy S8 and S8+ are not just your thing, the carrier is also offering a BOGO deal on the LG G6, another phone that is still a few weeks on the market. Similarly, this deal requires that you first purchase two G6 handsets and you’ll get a rebate on the second handset. This offer is on as at the time of this writing and will end on June 8, be it online or offline. T-Mobile had previously discounted the LG G6 from $650 to $500 and as such, this BOGO deal is based on the latter pricing. For those who feel the Galaxy S8 and LG G6 deals are still too much for them, well, you have a chance to grab the most popular phone from 2016 – Samsung Galaxy S7 – at half the price of the LG G6. Apparently, someone on eBay by the name BidAllies Store and with a positive feedback of 98.3% has listed a pre-owned Samsung Galaxy S7 for just $250. Apparently, this variant is locked to Verizon and as noted, it’s not new, but the seller mentions that it’s in perfect working condition. You even get a massive 60-day money back guarantee if you don’t like the phone, but you’ll be the one taking care of the return shipping charges. Next Next post: Google I/O Event 2017, 17th to 19th May : Speculating on What’s in Store!